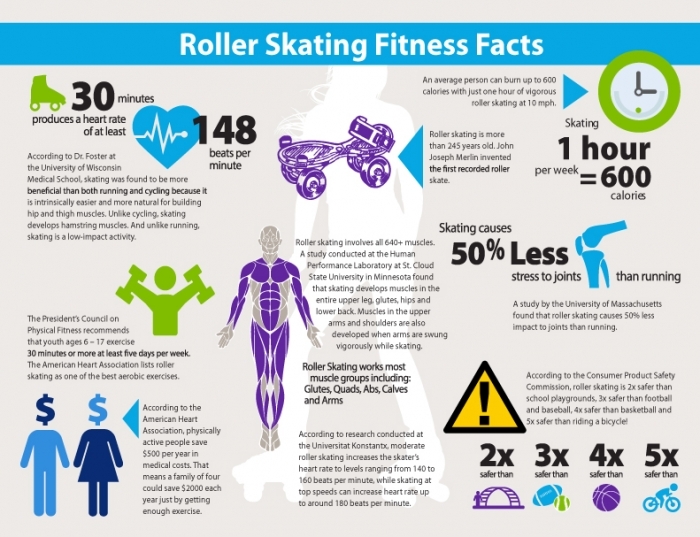 read up on some healthy roller skating fitness facts! · Roller skating is equivalent to jogging in terms of health benefits, calorie burning, reduction of body fat and leg strength development. · Just one hour of moderate roller skating (6 mph) burns 330 calories for a 143-pound person. If that same person skates vigorously (10 mph), he or she will burn up to 590 calories an hour! · According to a study at the University of Massachusetts, skating causes less than 50 percent of the impact shock to joint compared to running. For more information on the healthy benefits of roller skating, contact your nearest RSA-member roller skating center or visit www.rollerskating.com. Since 1980, the percentage of children who are overweight has nearly doubled. Almost nine million young Americans, or about 15 percent of all children, are overweight today. Without the proper diet and exercise, these children will be more susceptible to obesity-related health problems such as heart disease, hypertension and Type II diabetes when they become adults. A recent report published by the Centers for Disease Control recommends that adolescents be physically active daily, or at least be active nearly every day while they participate in play, games, sports or planned exercise during the context of family, school, and community activities. This challenge may not be easy to accomplish considering physical education programs and recess at schools are being reduced and eliminated. In addition, children prefer sedentary activities such as video games and television to physical activities like sports. Today, kids need help and encouragement to stay in shape and live a healthy lifestyle. Roller skating provides a great way to exercise, and kids get to do what they like to do more than anything in the world – hang out with friends and listen to music. Kids may not realize that while they are socializing with their friends on skates, the activity itself is better than running the same distance. According to the U.S. Secretary of Education, Rod Paige, “Kids today must be physically active for at least 60 minutes a day.” Roller skating provides a great way to be physically active for hours. • Roller skating is equivalent to jogging in terms of health benefits, caloric consumption, reduction of body fat, and leg strength development. • Roller skating is safer than jogging. inline skating causes less than 50 percent of the impact shock to joints compared to running, according to a study conducted at the University of Massachusetts. • Studies have shown that roller skating provides a complete aerobic workout and involves all 640+ of the body’s muscles, especially the heart. • The American Heart Association recognizes and recommends roller skating as an aerobic fitness sport. • Just one hour of moderate roller skating (6 mph) burns 330 calories for a 143-pound person. If that same person skates vigorously (10 mph), he will burn up to 590 calories an hour!